I have always been interested in history, cultures, art, languages and travel, so when I found out that my Mormon ancestors had tracked our roots on my grandfather’s side into the 1700s I could not wait to learn more. Much to my surprise, I found out more that I ever dreamed. My grandfather’s name is Wiley Galbraith, and he was born in Windsor and married my Grandmother, Mary Irvine McDonald in Windsor and later moved accross the Detroit River in the early 1900s and bought a home in Hazel Park just north of 8 Mile Rd. He became a banker and continued to work even through the Great Depression. My grandmother took a job working at the Book Cadillac Hotel as a switch board operator, and used her paycheck to pay thier two story home off in just 18 months. Imagine that! Sunday night I decided to pull all the documents out regarding our ancestry. It was already midnight when I got started, but I logged on to Ancestory.com to see how it worked. Three hours later, I had traced my ancestors on the d side back to the 1700s and found our first ancestor who had emigrated here from Glascow, Scotland, James and his son Walter Galbraith in 1769. I also located our family castle, Culcreuch Castle in Stirling, Loch Lomond, Scotland. Yes we have a castle now the home of Hercules and Janet n of Culcreuch, Baron and Baroness of Culcreuch. It had been the home of Barons of Culcreuch since 1699, but before this was the ancestral fortalice of the Galbraiths and indeed the Clan Castle of the Galbraith chiefs for over thee centuries (from 1320 to 1630). Culcreuch Castle is now a bed and breakfast/hotel, so we plan on having a family reunion next summer! It’s been described as a ‘gem of outstanding beauty’, and yet is situated within twenty miles of Stirling, Loch Lomond, Callender, The Trossachs and Glasgow, and is but an hour’s drive from the city of Edinburgh. This is our family crest. Apparently the Galbraith Clan were pretty warlike, even rising up against the the Scottish Crown. This is our family crest – wolf! Well, I just wanted to share with you some of the history I dug up on my ancestors. Between my Mormon relatives and ancestory.com, creating an extensive family tree was not only fun but very easy. 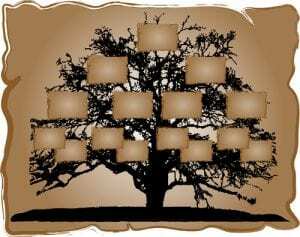 In addition, they allow you to invite collaborators to join and fill in their branches of the tree. Please share with me below what your experiences have been with seeking out your family heritage. If history, culture, travel, anthropology, languages are your hobbies, you may enjoy learning about your own past using this tool. What are you passions and hobbies? Do you make time for them? Are you encouraging others to join you?